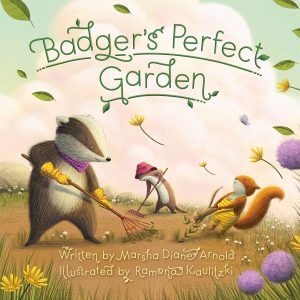 In a world fraught with bad news, a picture book about a badger’s desire to grow something beautiful can be a refreshing change. 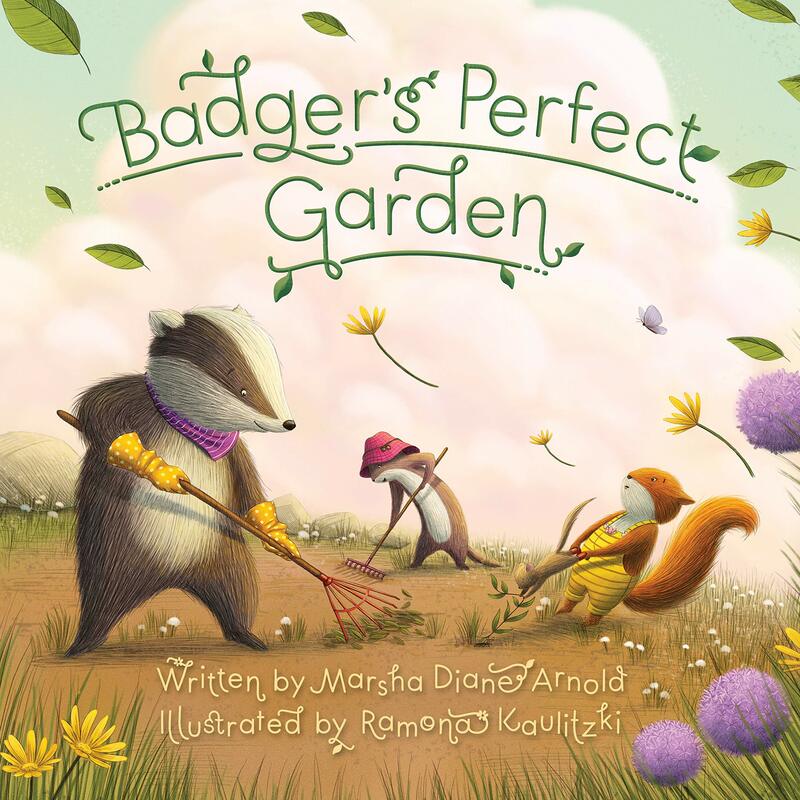 Badger’s Perfect Garden, by award-winning children’s book author, Marsha Diane Arnold, is just such a book. In Badger’s Perfect Garden, Badger wants to create something beautiful. He has been gathering seeds since late last summer and now he’s ready to plant the perfect garden. Enlisting the help of his friends, Red Squirrel, Weasel and Dormouse, he follows his “perfect” garden plan. Together, he and his friends rake the soil until it is “smooth as the forest pond in winter.” They line the rows perfectly straight and arrange the seeds by shape: bumpy ones here, round ones there, etc. It’s the perfect plan… until the sky brings wind and rain that only gets worse. Before Badger knows it, all his lovely seeds blow away and he is convinced he will have to start all over again collecting seeds late next summer if he is to finally have his perfect garden. What he discovers is that seeds are resilient. 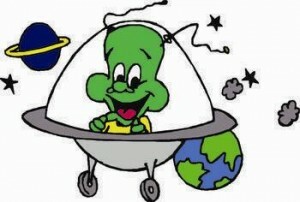 In fact, they almost have minds of their own! Badger’s Perfect Garden is a refreshing little book about life’s pleasures and surprises. 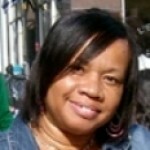 It is a book about what happens when one’s creative side is clamoring to get out. But it is also a book about how not everything can be planned; sometimes the most beautiful things are things that were never planned, but instead “just happened” when you (or in this case, Badger) weren’t looking. Ms. Arnold’s prose is impossibly sweet and almost reads like a how-to-plant-a-garden manual for very young readers. Artist Ramona Kaulitzki’s illustrations are as lush and colorful as they are furry and fluffy. Badger, Dormouse, Weasel and Red Squirrel look cuddly enough to squeeze. The jars of seeds, lush green grass and garden area of rich brown dirt are all a feast for the eyes. Even the illustrations of the wild rainstorm, rushing wind and purplish-gray skies conjure memories of hurrying inside a warm and cozy house while the storm rages outside. Use this book to open discussions about growing gardens, replenishing barren spots in the yard or neighborhood — and even how not everything can be planned, but even if it isn’t, it may still end up being more beautiful than one ever thought it could be.